About The Start to End Video Tutorial on Implementing Oracle Inventory in R12. As on 26th August, 2014, we reached the milestone of 2,500 subscribers! The response to this first of its kind Pay-Subscribe-Download video tutorial has been overwhelming! We have been touched and moved by the positive reviews, as well as guided and chastened by critiques of what needs to be improved. The intention of doing so, is to let our viewers know what users of our Start to End video tutorial have felt. If you have any questions or comments, please feel free to mail them to carla.stewart@oracle-apps-training-online.com. Brilliant demo of a real world Cycle Count... one of the most frequent and widely used processes in inventory management worldwide! And the female narrator provides a lucid explanation at each step. We have recently gone live on Oracle EBS R12, with minimal use of Oracle Inventory.But, I was planning on introducing the practice of Cycle Counting at our 3 largest warehouses in the cities of Rotterdam, Utrecht and Eindhoven. I just wasn't sure of how to implement the best practices built into the EBS Inventory module, so that they fit with our business processes. After studying the demo in detail, all my questions were answered! Now, I know what I need to do, and how. I also loved the complete Move Order Approval process demo! As a PL/SQL programmer, I have been working with Oracle Forms and Reports for quite some time now. But, I had reached a stage where the only possible way to grow in my career was to develop functional knowledge. I took a few courses from a training institute on Oracle EBS, but was disappointed to find that they teach you very little beyond the basics! They taught me the components of ERP software, but their instructors had no real world knowledge of how to put these components together to develop a real world functional solution or functional design. A few months later, I came across oracle-apps-training-online.com on Google. I instantly downloaded the Trial version of the R12 Inventory Tutorial. I was blown away! This Tutorial teaches you how to think like you are in a live implementation project, and how to design solutions for real world business cases. That is exactly what I had seen functional consultants do, in my organization! I bought a 365 Days Subscription! By the sixth month, I was confident enough to apply for a position as an Oracle Inventory functional consultant. My interview went so well, that I knew I had a good chance. I am halfway through my first implementation project as an Inventory functional consultant, and whenever I have any doubts, I revert back to the Video Tutorial! My success... I owe it all to you guys! Please get us similar video courses on P2P and O2C! I need it from YOU guys... to accelerate my growth. I was so positively amazed by the methodology followed in the Video Tutorials, when I reviewed the Trial version that I bought the subscription as soon as my Trial period expired. The creators of this Tutorial have decide to explain EACH and EVERY concept in Oracle Inventory, through the use of examples. And those examples are simulated in a close to real life business scenario. And every concept is linked to the other in a logical process flow. So the user can quickly relate to what is being taught, and visualize how to put that knowledge into practice! I found myself handling the implementation of EBS R12 Inventory, when the lead Inventory guy left the project (and the company). As a Purchasing lead, I had basic knowledge of Inventory, but not enough to implement the entire module on my own. With just a few days left for the Workshop Test Pilot (WTP) at the cleint site, I was desperately looking for ANY material that would give me a grip on this module. That is when Google took me to oracle-apps-training-online.com. I was stunned that the site allows you to download a Trial version of the COMPLETE tutorial for review. That's like a Hollywood studio releasing an entire movie as a trailer, to help viewers decide if they would like to buy tickets for their family and friends! Who does that in today's world?!! The video sessions are so realistic, based on real world examples that by the time I finished with the last session, I decided I needed to own this tutorial. I bought the paid subscription. It's a fraction of the price any other training institute would charge you for a full fledged training on Oracle Inventory R12. I was able to deliver my sessions with confidence at the WTP establishing my credibility as a functional expert with the client, and my team! My request is - please create similar video tutorials for other modules, as well. 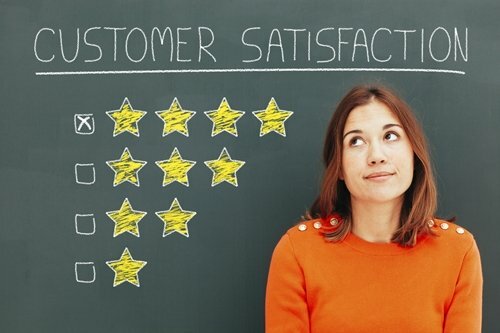 This is the best training material on Oracle Inventory that I have found on the web! 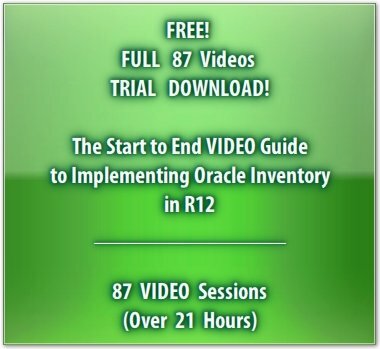 I have spent my parents money on Oracle coaching institutes in my city, but when I reviewed the Trial version of the R12 Inventory Video Guide, I was convinced that this subscription will be my best investment so far. I am glad I took that decision. After a month of regular viewing and practice, I added Oracle Inventory as an area of my functional expertise. I was able to apply for a consulting position in the IT division of a Multi National Corporation. In the interview I admitted that Oracle Inventory was my area of expertise. Based on what every video session taught me, I was able to answer most of the interview questions with knowledge and confidence. I am so happy I got the job, and more importantly, an entry into the profession of ERP consulting! I am very satisfied with the overall coverage of topics in Oracle Inventory within the Start to End Video Tutorial. I have been working on the Financials modules, and wanted to move into the supply chain/distribution side of Oracle EBS. My team lead suggested this site to me. If you are new to Oracle Inventory, you may need to spend a little more time in the beginning, to get a grasp of the fundamentals. But once you are through with the initial stages, you gain speed and gather momentum. New topics begin to make more sense, thanks to the lucid explanation, and the beautiful screen-by-screen simulations! And oh, not to mention the graphics! If you want to develop the skills of a functional consultant in Oracle Inventory, and do not have a ton of money to burn, I would advise you, look no further! What this video training course on Inventory has done for me, no other training institute could! I am an Oracle EBS technical consultant by profession, and was really, really hoping to switch to the functional side. After working on this video tutorial, I began handling functional issues in Oracle Inventory to begin with. I must have impressed someone up the ladder, because now I am being asked to look into the Order to Cash cycle as well! Please publish a complete tutorial on the O2C modules too! And please make it quick! I am really happy with the way the video covers the closing of Inventory periods! You will hardly find any detailed material on the web, that shows you how to do a Month-End Period Close in a real life project! Thank you for these detailed demos guys! The most detailed and clearly explained material on Oracle Inventory that I have seen to date. What I like most is the in-depth analysis of what we do, and why we do it. I will give this a 4 star. I took away 1 star, because I felt there should have been a male voice too, in the narration. I had bought the subscription for 100 Days. Because of work, I could not stick to the totorial as regularly as I had initially intended to. I even lost track of when my 100 Days expired! I then mailed Carla Stewart from the Content Access team, requesting a little extension. I was expecting a polite "No", but was blown away, when Carla responded by extending my Password for another 3 weeks... and for NO extra charge! I could sense that the consultants manning this site, are truly wanting to help out professionals on the field!